How much does vape temperature of ABV effect potency? Discussion in 'Cooking with Cannabis' started by Lady_Luck, May 24, 2018. Hello all! I am looking to explore cooking with ABV. My husband's preferred temperature on our analog Volcano is 396. Would the resulting ABV still be viable potency wise at this temperature? I am looking to make a coconut oil in my MB2 for use in brownies. I planned on using 14g ABV for the 2 cup minimum. Is this realistic? I understand the original potency of the flower effects the outcome as well, but am worried the ABV may not be viable after being vaped at that temperature. Any thoughts are much appreciated! I think that should be fine. Should be plenty enough actives left for the MBM to extract into oil. Should make some nice sleepy body buzzy meds. Just remember to go easy at first. Even 14g of AVB in 2 cups can be overwhelming meds for some. It's all tolerance dependant. Start with small doses and give it 2-3 hours to kick in. Whisper, Sickboy420, steama and 2 others like this. 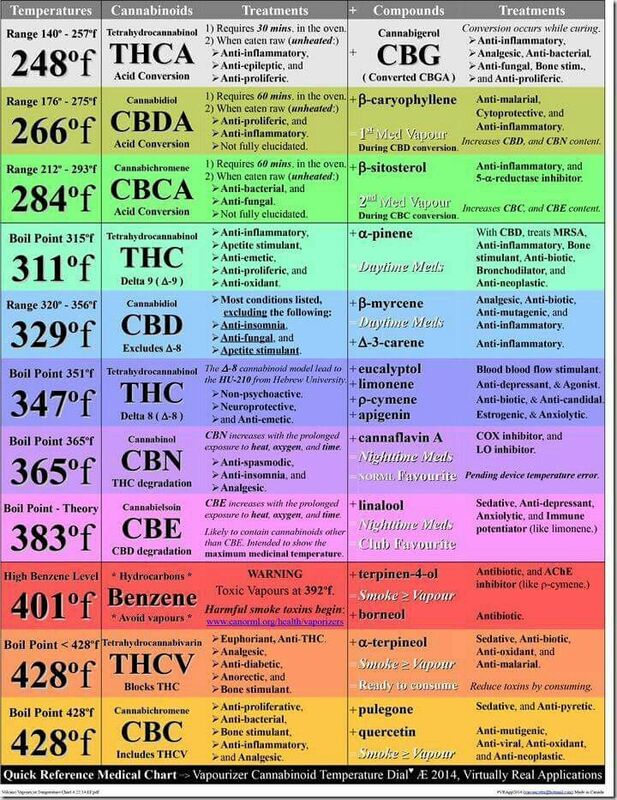 I never vape below 356F or over 410F. My ABV hits like a truck, even in small doses. Does that help a bit? Every fool is different, but your 14g per 2 cups ratio seems fine to me. breiter_fighter and GreenHopper like this. Thank you! This chart is great! We both have a high tolerance, but not much experience with edibles. I will follow your advice, thanks! Good to hear, thanks! I'll take care with the brownies. GreenHopper and Dynavaper like this. I made brownies a week or so ago and decided to water cure my ABV first. Best decision ever! The coconut oil was a beautiful green color when strained. I used a Mason jar full of ABV and just covered it with coconut oil. Prior to this I blended it for a smoothie like consistency and drained thew water through cheesecloth. It was simmered for a week for around 12 hours a day and off at night. Recipe called for 3/4 cup oil and I used 1/2 cup coconut oil and 1/4 cup of vegetable oil. My wife takes a 1X1 inch square and that is enough for her! She gets visuals, auditory, sensation you name it! Then she sleeps like the dead! Perfect for her conditions! I have taken 2 squares and it was a nice buzz! The problem I find with ABV edibles is that if i OD on them, I just get super sleepy and hit the bed. With regular edibles it is a total different kind of animal! Great for the zoo! Very dependent on tolerance. I would start with a 1X1 to be safe! Helios, Madri-Gal, WeedyGirl1979 and 2 others like this. due to having a very small supply, I need to wring out every mg lol. I finish all loads at 445 and there still are ample goodies left for edibles. With your temps under 400, you should have no problem making strong edibles. Can you give details of the water cure? How long did it take to do a water cure? Did you "dry" your cannabis after the water cure? HOW? Fill a Mason jar with your ABV and then fill with fresh cool water. Cap and shake the jar and let stand for an hour or so. The bud will separate from the water and keep checking the colour of the water. When it darkens, drain the water and exchange with fresh water. Keep doing this until the run off is either clear or very slightly yellow. Mine took about 2 days to run very slightly yellow. Once the run off is clear or light yellow, I placed the watery mix in a blender and turned it into a smoothie. I then poured this slurry mix into cheesecloth and squeezed all the water out of the ABV. The result is a slightly damp ABV that does not smell. My coconut oil came out a lovely green color instead of the usual disgusting brown. lazylathe, Since you wring the ABV, you just add the oil to that mixture? The small amount of water will make no difference? Last time I made coco oil, I did not water cure. This time, I want to try it. I followed a recipe, cook for 12 hours, cool, freeze. I did this for 4 days. Should I go for a week? From your experience, do you feel the longer cook times will make that much difference? Thank you for any feedback. There is a little bit of moisture still in the damp ABV but that does not pose any problem at this stage. When simmering the mixture the water will evaporate away, so no need to worry. 4 Days should be good, that is when I usually have had enough of it. Once simmered, strain again through cheesecloth, use gloves!! If you are baking with it, look for a recipe that uses the most amount of oil as this will make potent edibles! Helios, WeedyGirl1979 and Whisper like this. Last batch that I made, was placed in a crock pot over night, when I checked in the morning, the water was boiling. I saved the mixture, but I think I over cooked it. It seems to have no effect. Should I retry cooking or has it passed that phase? Does it still have CBD in it? I figure it has something in it. Surely, this is not an isolated incident. Has it happen to anyone else? What did you do? breiter_fighter and Madri-Gal like this. I've never had the same issue, but what I would do is use it. I'd try something like brownies, so if it was potent still, great, if not, hey, brownies . breiter_fighter, Whisper and lazylathe like this. I have been eating the oil, it's a nice green color. There are no effects, that I can pin point, but maybe it's helping the pain be less. I just pop it in my mouth, and go. You just eat the oil? Bold move. 10 points for that. You eat the oil not knowing if it helps, 10 points. I actually lost 5 points by being more interested in the brownie than anything else. Oh Madri-Gal, these lips eat lots of brownies. With that particular batch, I did the water bath for about 4 days to get rid of the "taste". I also put a drop or two of lemon oil, to counteract the flavor, so I had some time put into these. No way I was throwing it out, I just hope I am not eating oil, like some damn fool, for no reason. Helios and Madri-Gal like this. I also hope you are not eating oil, like some damn fool, for no reason . Totally legit to experiment, right? We're just trying to figure out how to get the most/best out of our ABV. I'm loving washing the ABV. Makes me feel less guilty for not doing housework. This year I tried washing part of my crop, and will continue the practice. I water cured some buds, and liked the result. Will continue water curing part of each crop in the future. I tried water curing some dried bud, and that went ok. Eventually I might vape enough watercured bud to have enough ABV to compare water curing later, or to try water curing ABV from watercured bud. I'm having a heck of a good time checking it all out. I'm having a good time talking to you. I'm hoping you are also enjoying life. breiter_fighter, Nina, Helios and 1 other person like this.